They say if a stork swirls up the nest near one’s house, it is a good omen. When a stork brings a baby to one’s house, it’s the omen which doubles the benefit. The fairy-tale began on one hot summer day as it is today, the seventh of June, 2016. “Knock, knock on the window glass”. “Who’s here?” Come in. come in, neighbour”, greeted a nice-looking stout woman, opening the window wide. On the floor, in the middle of the blue-and-white carpet, stood a tall unknown fowl. Her red beak was holding a basket with a pretty-face baby. “This is a gift for you,lady”, said the bird. “He will bring you happiness and peace to your home”, continued the bird. Jan stepped out of the kitchen where he prepared his favourite breakfast: frying sausage and scrambled eggs, sprinkled with dills and shallots. And as a routine, a nice cup of coffee. “Oh, I see. He is a good boy, but what shall we do with him?” he echoed the same question as his wife did. Jan and Jana lived a long happy city life without children. 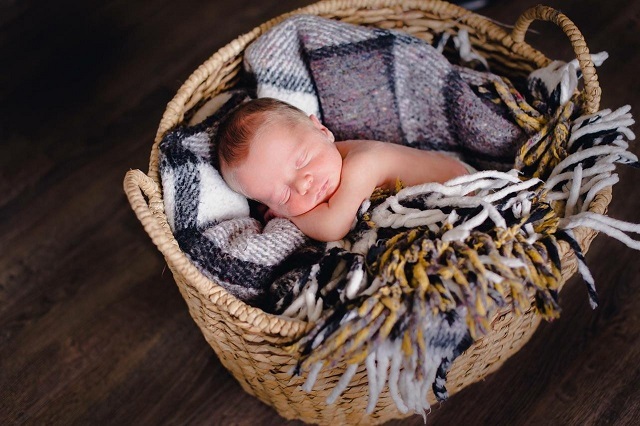 And now a surprise: here he is … a red-cheeked baby, sleeping in the basket. “Who brought it to us?” asked Jan to Jana. “The bird?! What on earth bird can bring babies! Where is he?” asked Jan, looking around. Nobody was in the room, except the baby in the basket. “but I saw him a minute ago. He stood on long-long red legs, holding the basket in his beak.” kept on talking Jana. “What was his name? Did he introduce himself?” asked Jan with reproach. “No, I did not ask his name”, said Jana, feeling guilty for her inattentiveness. She was too much involved in baby, completely forgetting about the neighbour. “Oh, he is our neighbour, that means that he lives not far from us, let’s go out and find him”, proposed Jan. In no time they both were on the street. “you said that the bird was long-legged with big beak. That is supposed to be a stork. Look up on all the trees above. There must a stork’s nest, I think.” told Jan in aspiration. They looked in the sky and saw a huge nest belonging to a stork. “thank you, Mr. Stork, for a wonderful present you’ve brought to us this morning”, they shouted very loudly in fear that the boird would not hear the at a big distance from the earth. However, the stork heard them, smiled and waved with his wide wings. He responded: “You’re welcome, you’re welcome, dear friends.” And the stork was gone. “What happened to the baby?” somebody could be interested. In some while he became a young, helpful man, polite and hard-working. And, imaginative, in all respects, because the only imagination makes a person human.